There is one locality about which I am puzzled, that is Ballintaggart. One of the owners told me that Ballintaggart House was built in 1703 as a hunting lodge and that it functioned as a soup kitchen during the Potato Famine (1845-1847). The giant soup urns can still be seen in the courtyard. However looking through the book entitled "Houses of Kerry" by Valerie Bary, I see that she records it as having been built in 1830 by Samuel Murray Hickson, a brother of John Hickson, the last feudal sovereign of Dingle. Ballintaggart House has operated as a hostel since 1990 and was fully restored in 1996 to provide en suite Private and Family rooms with a fully serviced campsite. I wondered if there might be some confusion about the building, so looking inside I noticed that the description used by Mrs Bary fits this building, that is "... the hall, leading to the stairway, is divided by two fluted pillars ...". It seems to me that it would be extremely unlikely that there were two such buildings in the same area with the same name and this same feature. I must conclude, therefore, that the two descriptions are for the same house. From my own (very extensive) records, I know of two people called Samuel Murray Hickson. One was born in 1785 and "died in 1816 in Ballygrove". I have a note that he lived at Redcliff(e) or Radcliffe, Ireland. He was indeed, the brother of the above mentioned John Hickson. My reference for these dates is from the Rev Patrick Stephens of the Dingle Union of Parishes. However another researcher has come up with a precise date for his death which fits much better, namely 6th July 1844 - just before the potato famine, so I am much more inclined to believe this date. One source records that Samuel was a Justice of the Peace, unmarried d.s.p. Another source states that he married Anne Folkes. The University of Dublin indicates his attendance from age 15. The other Samuel Murray Hickson was not born until 1834 and died in 1899 in Australia, the son of James Hickson of Lansdowne (died 1855 in Redcliffe) and Barbara Godfrey, so he doesn't fit. 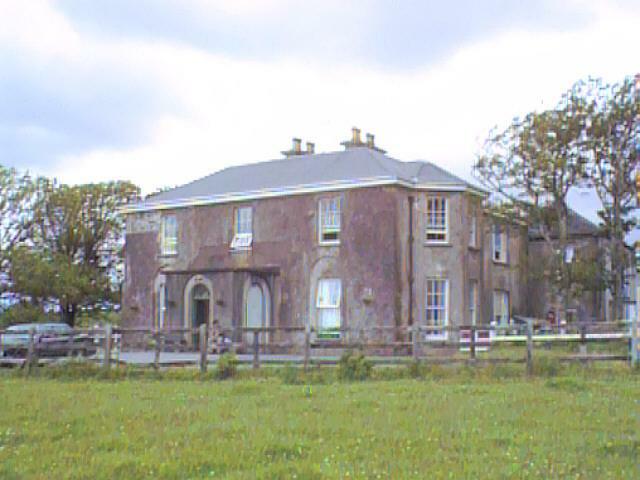 Other records record that there were two branches of the Hickson family living in Dingle, one on the Northern side of the peninsula (Catholic with their family seat at Fermoyle) and one on the Southern side with their seat at The Grove, Dingle and other properties at Ballintaggart and Redcliffe. This family was Protestant. One of the latter was Robert Hickson who married Barbara Trant ca 1711. His grandson, Robert FitzJohn Hickson (1749-1844), is the next to be mentioned. He married Judith Murray in 1776 and was the father of the Sovereign, John, and Samuel Murray Hickson. Robert's family seat (property) is listed by Burke in his Irish Landed Gentry' (1912) as "Ballintaggart, Dingle, Co Kerry. Residence - Commandant's House, Canterbury, Club - Naval and Military". I have a later record of the birth of a Robert Albert Hickson to Robert Hickson and Julia Sophia Sadlier Bruyere on 15th September 1848 in Ballintaggart. This is the last mention of a Hickson in Ballintaggart. Mrs Bary records that, "later, David Peter Thompson, Lord Ventry's agent, lived here". Can anyone tell me where "The Grove" was situated? More especially can anyone tell me anything more about the possible date of construction (1703 or 1830)? Thirdly can anyone tell me where Ballygrove is/was, and also where Redcliff or Radcliffe is/was? Finally is anyone able to substantiate any of the above? Has anyone seen an entry for Robert Hickson in Burke's Landed Gentry, 1864? If so please let me know. Burke's Peerage for 1875 says "Robert, ancester of the family of Ballintaggart." Ballintaggart House is located on the Anascaul road, (the main Tralee/Dingle road), 20 minutes walk from Dingle town centre or about 1.6 km before arriving in Dingle Town. If you would like anymore information please e-mail Ballintaggart House.